Two exhibitions, both opening on October 20, 2013 at The Ukrainian Museum in Manhattan's East Village, commemorate the 80th anniversary of the Holodomor, the famine-genocide that killed millions of Ukrainians. 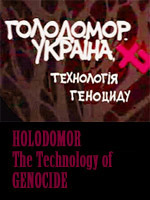 Give Up Your Daily Bread… Holodomor: The Totalitarian Solution is an extensive documentary exhibition consisting of photographs prints, documents, government reports, eyewitness accounts, and other archival material detailing virtually every aspect of the tragedy. Evocations, a collection of works by acclaimed artist Lydia Bodnar-Balahutrak, presents thought-provoking interpretations of the Holodomor and other dark periods in Ukraine's history. The opening day program, which begins at 2 p.m., will feature two guest presenters: Lydia Bodnar-Balahutrak, who will give a gallery talk about her works, and Professor Ray Gamache of King's College (PA), who will present his recently published book Gareth Jones: Eyewitness to the Holodomor (Welsh Academic Press, 2013). Give Up Your Daily Bread… Holodomor: The Totalitarian Solution and Evocations will be on view through December 29, 2013. James Mace (1952-2004), an American historian and the director of the U.S. Commission on the Ukraine Famine in Washington, DC (1986-90), referred to the Holodomor (literally, murder by starvation) as "the crime of the century that nobody's ever heard of." The horrific event took place in 1932-1933, less than twenty years after Ukraine was forcibly incorporated into the Soviet Union. Determined to force all Ukrainian farmers onto collective farms, to crush the burgeoning national revival, and to forestall any calls for Ukraine's independence, the brutal Communist regime of Soviet dictator Joseph Stalin embarked on a campaign to starve the Ukrainian people into submission. The Soviet government confiscated all the grain produced by Ukrainian farmers, withheld other foodstuffs, executed anyone trying to obtain food, and punished those who attempted to flee. As a result, in the land called the Breadbasket of Europe, millions of men, women, and children were starved to death. The Soviet regime, behind its Iron Curtain, denied the existence of the Holodomor for decades, denouncing any reports as "anti-Soviet propaganda." It was not until the breakup of the Soviet Union in 1991 and the subsequent establishment of an independent Ukraine that the contents of many sealed government archives were uncovered, exposing a wealth of gruesome information. Give Up Your Daily Bread draws on the archival materials at The Ukrainian Museum, and other institutions and organizations, to trace the events leading up to this tragedy, to document the extent of the famine and its effects on the Ukrainian nation, and to explore how the atrocity of such magnitude could have escaped the attention of much of the world. It also explores to what extent the world was actually aware of this genocide at the time. In Evocations, the Museum brings together a collection of Lydia Bodnar-Balahutrak's art, whose reflections on tragic events in Ukraine's history are intertwined with her passionate sense of the Ukrainian cultural traditions that were instilled in her by her parents and grandparents, who fled Ukraine during World War II. 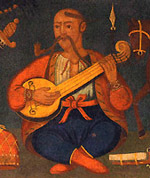 The art critic Olena Chervonik writes, "Bodnar-Balahutrak skillfully employs classical motifs, Christian iconography, folk imagery, archival photos, and various cultural artifacts to construct a complex narrative of human suffering and compassion related to multiple events in the history of the Ukrainian nation. The artist often collages into her works ragged photographs and newspaper clippings that document historic events and horrific deeds…. Merging traditional icon imagery with copies of photographs of actual famine victims of the Holodomor, the artist draws attention to new kinds of martyrs who perished in the genocide waged by the Soviet regime against the Ukrainian nation. In her series Another Kind of Icon, she includes embroideries, carved wooden frames, and other collected ethnographic material. These artifacts, which once belonged to Ukrainian families, introduce a personal dimension and palpable immediacy to a nation's tragedy….Bodnar-Balahutrak adds a compelling archeological dimension to her work with her predilection for varied fragmented materials like burnt wood, broken pottery, ruptured textiles, and torn paper remnants. Like an archeologist and archivist, the artist sifts through Ukraine's past, unearths stories of death and rebirth, of destruction and of soaring creativity, and brings them to the surface." Lydia Bodnar-Balahutrak was born in Cleveland, Ohio, completed her undergraduate art studies at Kent State University, and, in 1977, received her Master of Fine Arts degree in painting from George Washington University, Washington, D.C. She now lives and works in Houston, TX. Bodnar-Balahutrak has been a guest lecturer at the Lviv Academy of Art (1991); she received a Creative Artist Program Award in Visual Art from the Cultural Arts Council of Houston (1993). Solo shows include "Chornobyl" at the Art Gallery of the University of Houston/Clear Lake (2006); selected works from her ongoing series "Hide and Seek" at Nau-Haus Art Space and the College of the Mainland Art Gallery, and at the Arkansas Arts Center and the Art Car Museum (2010-11); and "Thresholds" at the Pearl Fincher Museum of Fine Arts (2012). The artist has participated in national and international exhibitions and her work can be found in museum and private collections in the USA, Canada, and Europe. Bodnar-Balahutrak's current mixed media paintings and drawings continue to explore collage, text, and figuration. A monograph focusing on her art from 1979-2001 was published in 2005. She had taught painting and drawing at The University of Houston at Clear Lake and HSPVA, and is currently on the faculty of the Glassell School of Art, Museum of Fine Arts, Houston. Gareth Jones: Eyewitness to the Holodomor by Ray Gamache, Assistant Professor of Journalism in the Department of Mass Communications at King's College, Wilkes-Barre, PA, is the first academic study of Gareth Jones, now recognized as one of the first journalists to reveal the horror of the Holodomor, the Soviet government-induced famine in the early 1930s which killed millions of Ukrainians. Of interest to students of journalism, eastern-European history, and political studies, this book provides a fascinating insight about one of the most devastating events of the 20th century and the social, economic, and political factors that contributed to the famine. A fluent Russian speaker, Jones traveled as a foreign affairs adviser to David Lloyd George and Ivy Lee, two of the most influential people at that time. The Aberystwyth and Cambridge-educated Jones investigated reports denied by the Soviet government that their Five-Year Plan had led to mass starvation by visiting the affected region and living with the Ukrainian people. 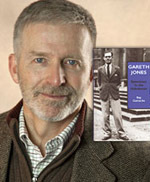 Gareth Jones's numerous articles, published in the UK (Evening Standard, Daily Express, and Western Mail), as well as those written about him in the US (New York Evening News and Chicago Daily News), exposed the Holodomor, but Jones's credibility and integrity were immediately attacked and denigrated by the Soviet government and its sympathizers within the journalistic profession, including Walter Duranty of the New York Times. Concert: "Songs of Truth: The Art of the Kobzari"
Third-generation bandura player and New York Bandura musical director Julian Kytasty will draw on a lifetime of study to present the full spectrum of the kobzar repertoire, a tribute to the art of Ukraine's blind epic singers: ancient epics and laments, humorous burlesques, religious and moralistic songs, sparkling instrumental dance tunes, and songs of social commentary. The concert will be a rare opportunity to experience a tradition largely destroyed in the Holodomor and the Stalinist repressions of the 1930s. Sunday, October 27, 2013, 2 p.m. Presentation by Dr. Yuri Shevchuk, Department of Slavic Languages at Columbia University, sponsored by the Ukrainian Film Club of Columbia University. This 2-part documentary (58 min. & 53 min., 2005, Ukraine, Ukr. w/Eng. subtitles; Eng. voice-over and subtitles) is a detailed step-by-step factual account of how the artificial famine of 1932-1933 in Ukraine was conceived, executed, covered up; who its masterminds, perpetrators, and apologists were; and against whom it was directed. Saturday, November 2, 7 p.m.
Gallery talk "Poster Politics in Ukraine"
Guest curator, Dr. Myroslav Shkandrij, professor of Slavic Studies at the University of Manitoba, will discuss the exhibition, which is comprised of 28 original posters (27 of these were donated to the Museum's permanent collection by Dr. Jurij Rybak and Anna Ortynskyj), the politics behind the propaganda, and their artistic expression. Following the Revolution of 1917 and the end of tsarist rule, political posters were used to reinforce the new state's directives and to convey a positive image of the new regime. The rhetoric and slogans of Bolshevism appear hollow in light of the collectivization of 1929-31and the famine of 1932-33, which laid waste the country. Hundreds of thousands were deported to Siberia, and millions died. It is ironic, therefore, that the message of these posters is frequently aimed at the Ukrainian peasantry and the requirement that they give up their grain for the revolutionary cause. 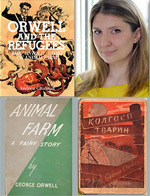 "The Lessons in Animal Farm," a presentation by author Andrea Chalupa about her book Orwell and the Refugees: The Untold Story of Animal Farm (2013). George Orwell's anti-Soviet satire Animal Farm (1945) was not welcome at a time when the West needed Stalin to fight Hitler, and leading intellectuals still believed in the promise of the Russian Revolution. A Ukrainian refugee in 1945, Ihor Ševčenko [Shevchenko] (1922-2010), the eminent Byzantinist and Dumbarton Oaks Professor of Byzantine History and Literature at Harvard University, recognized the Animal Farm's profound meaning, and translated the book into Ukrainian for distribution in the displaced persons camps of post-WWII Germany and Austria. Of the 5,000 copies printed, only 2,000 books were given out; U.S. soldiers, suspecting the books of being anti-Stalin propaganda, confiscated the rest and handed them over to Soviet authorities to be destroyed. As a teenager in the DP camps, Andrea Chalupa's uncle managed to bring a copy of the translated Orwell masterpiece with him when he immigrated to the United States. Her narrative explores the immigrant story from the years of the Holodomor (1932-33) and the Stalinist purges of the 1930's to refugee life and her family's experience in the DP camps during and after the war.